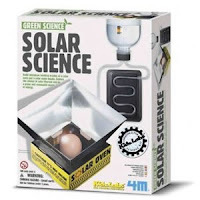 At one of the local schools they are having a project involving the Solar System so I have been asked about some of the items we stock on that line. One of them is a Solar System Mobile Making Kit which contains a complete set of Solar system planets, a glow paint stick, stencils for applying the glow paint and the complete hanging structure along with detailed assembly instructions and loads of fun Solar System Facts. When it is assembled, hang it from the ceiling and watch it glow in the dark when the lights are out. 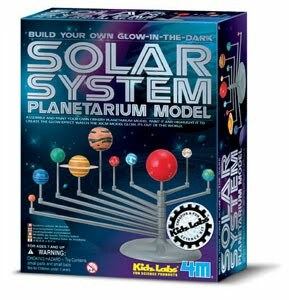 There is also our Solar System Planetarium Model which when assembled represents the planets within the solar system and their orbits. This also comes complete with glow in the dark paint for special effects and an informative wall chart of the Solar System. Still on the same subject, I would be interested in making these next two items myself and seeing how they work. 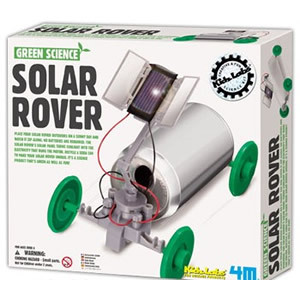 One is a Green Science Solar Rover kit. 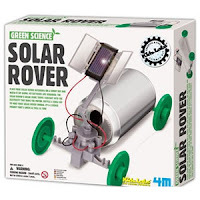 A excellent little kit where the instructions and parts are enclosed to enable you to build a solar powered car out of a drinks can and learn about solar energy while recycling. The other is a Green Solar Science Kit which has all you need inside to build a small solar oven and a solar powered water heater which at the same time gives you the chance to learn about solar energy. 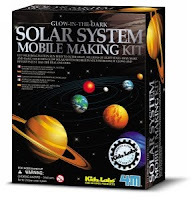 All these kits are great educational items and hopefully give an insight to our Solar System and Solar Energy.